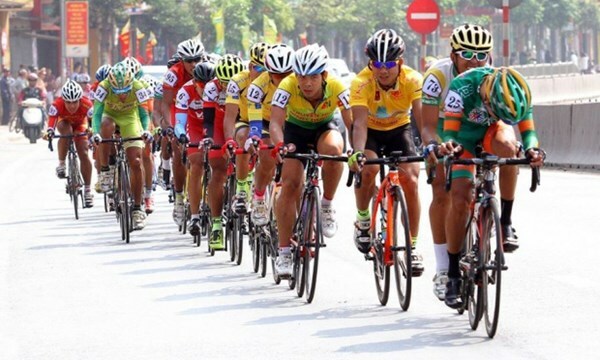 HA NOI (VNS) — Nguyen Quoc Dinh stole the yellow jersey at the HCM City Television Cycling Tournament after the fifth stage from Vinh City to Dong Hoi City yesterday. The rider from Ben Tre finished in the leading group and jumped to top of the overall rankings with a time of 13hr 13.52min. Nguyen Minh Viet of BTV Binh Duong is second, followed by Ho Huynh Van An from Gao Hat Ngoc Troi An Giang. The fifth stage was the longest of the tournament, and welcomed a new stage winner – Ho Van Phuc of ADC Vinh Long Television. Phuc took 4:50.03 to cover 199km, cycling at an average speed of 42.165km/h. Phan Hoang Thai of Domesco Dong Thap and Le Van Dong of VTV Can Tho were second and third, respectively.